The Power of Commitment & Consistency! We have all heard stories of how people are often unwilling to intervene when they see a crime committed in broad daylight. Why would people put themselves at risk to assist a complete stranger? Well, in 1972 the psychologist Thomas Moriarty conducted a study to see if he could use a simple psychological weapon to persuade people to put themselves at risk of personal harm for a person they had never met before. The research involved the staging of a number of thefts on a New York City beach. For the experiment a researcher would place a beach blanket within 5 feet of a randomly selected individual. After about two minutes on the blanket relaxing and listening to a portable radio the person would stand up and leave the blanket to walk down the beach. Within a few minutes a second researcher would walk by and grab the portable radio before trying to make a get-away. In the control (i.e. no intervention was made) only four people out of twenty tried to prevent the theft. However, the number of people who were prepared to challenge the thief increased dramatically when the researcher asked the individual next to them to please “watch my things” before walking away. In this scenario nineteen out of twenty people challenged the thief. The experiment confirms that people have a strong desire to appear consistent with commitments they have previously made. Indeed, in his book Influence, the psychologist Robert Cialdini argues that commitment and consistency is one of the most powerful weapons of social influence available to people wanting to change our behaviour. Why is consistency so important to people? Consistency is generally regarded as a highly desirable personality trait in our culture. When people don’t appear consistent they are often seen as indecisive and two-faced. The negative perception of inconsistency reinforces the belief that consistency is a valuable characteristic to portray. However, Cialdini also noted that such is our desire to be consistent that people sometimes act without thinking and abandon strongly held beliefs in order to stubbornly follow a consistent path. He argues that a commitment can change our self-image and force us to act contrary to our own best interests. “When it occurs unthinkingly, consistency can be disastrous. Nonetheless, even blind consistency has its attractions” – Robert Cialdini, Influence. In this sense commitment and consistency can can sometimes lead to undesirable behaviour as people strive to be consistent almost without regard for the consequence. Why does consistency become a habit? Due to our motivation to be consistent we will often automatically make decisions based purely upon achieving this consistency. This of course saves mental energy as it avoids complex decisions. But it can also shield us from the negative and unpleasant consequences of our actions. “Sealed within the fortress walls of rigid consistency, we can be impervious to the sieges of reason.” – Robert Cialdini, Influence. Commitment and consistency can result in some disastrous decisions when it leads to automatic behaviour. This occurs because people are so keen to be perceived to be consistent because it is perceived to be a positive characteristic. Psychologists believe that stubborn and ill-considered consistency is often the result of people making a public stand or commitment to something. Once such a commitment has been made people have a tendency to try to ensure consistency at almost all cost even though it may go against their inner beliefs. Just look at how UK MPs have supported Brexit since the EU referendum. According to a poll by the Press Association over two thirds of MPs voted to remain in the EU in the referendum. But as the Prime Minister and many MPs made a public declaration to abide by the result the vast majority of MPs voted to support the Bill to trigger Article 50 to take Britain out of the EU. This is despite the fact that only 52% of voters supported Brexit and many MPs still believe Brexit will seriously harm the economy and the UK’s standing in the world. That is quite extraordinary behaviour and is a clear consequence of the power of commitment and consistency. The psychologist Steven J Sherman arranged for a sample of residents in Bloomington, Indiana, to be telephoned for a survey. Participants were asked to predict what they would say if they were asked to give up 3 hours of their time to collect money for the American Cancer Society. Not wishing to appear selfish many of the people called indicated they would volunteer. This resulted in a 700% increase in the proportion of people volunteering when they were contacted a few days later by an operator from the American Cancer Society. Another strategy used by charity call centres involves asking people about their current well-being. The operator asks something like “How are you feeling this evening?” Once a person confirms publicly they are in good health it is much harder for the individual to refuse to help people where all is not well. The theory here is that people who have just indicated that they are doing well find it awkward to appear uncaring by not donating money to the needy in this context. Start small to aim big! There is also the foot-in-the-door technique which means that by starting with a small request we can often get compliance later on for a much larger request. This can work in two ways. Firstly it establishes a commitment to a cause which means we are more willing comply with much larger additional requests. Secondly it can change our self-image from a prospect to a customer or a citizen to a supporter of a cause. This latter effect can result in people agreeing to requests that are only remotely connected to the original small favour they complied with. Deeds are more influential than words! To understand a person’s attitudes and beliefs we tend to observe their behaviour. Psychologists have discovered that we also look at our own behaviour to guide our feelings and attitudes. Our deeds are much more influential than words when it comes to our inner beliefs. And writing our thoughts on paper is one way of showing our commitment to a cause. Writing our ideas on paper is more effective than a verbal commitment because research indicates that the greater the effort we put into a commitment, the more effective it is at influencing our attitudes and behaviour. Further, a written commitment also acts as physical evidence of our support for a cause and it reduces the likelihood that we might forget or deny the act. In may also be used to persuade other people because we have a natural tendency to believe that written statements accurately reflect the beliefs of the person who made them. This is one reason why salespeople will often ask prospects to complete sales agreements as it is one way of getting them to make a small commitment to the purchase. Many organisations also get staff to set their own sales targets and commit to them by writing them down on paper. Testimonial competitions are another commonly used approach to benefit from the commitment phenomena as to have a chance of winning people know they have to be complementary about the product or service in some way. What they don’t realise is that such glowing statements help change their own attitudes towards the product as they begin to believe what they have written. People can be extremely stubborn with their commitment even in situations where accuracy rather than consistency should be the priority. Indeed, research involving the criminal justice system found that hung juries were significantly more common if jurors had to initially indicate their position with a physical show of hands rather than a secret ballot. The act of publicly sharing their initial opinion appeared to make them more reluctant to change their decision later on. This can be used to good use where we are trying to encourage people to give up a harmful habit such as smoking, over-eating or gambling. Many weight reduction programs understand that a person’s private commitment is not strong enough to withstand the many temptations that we come across every day. For this reason such programs ask clients to write down their weight targets and share them publicly with other members and family/friends. Can a commitment change self-mage? Studies suggest that commitments have most impact upon a person’s self-image and behaviour when they are active, public and effortful acts. In addition the change is most likely to be long lasting if the person own what they have done. Psychologists found that people are most likely to take ownership of behaviour if they feel they decided to undertake the action without any strong outside pressure. This means that using a large incentive, such as a cash prize, can be counter-productive as the individual may not accept inner responsibility for the act. Thus for people to take ownership of an act it is best to keep any incentives as small as possible. As Cialdini points out commitment is key. Get visitors to commit to something small, such as giving their email address for access to a white paper or your website and this increases the likelihood that they will perceive themselves as customers. Once they see themselves as customers this increases the chance they may purchase products or services from you. Lifehack.org is a leading wellbeing and lifestyle blog that publishes tips on how to improve many aspects of your life. When I was researching one of my posts I landed on the site and came across a great example of how to use a small commitment to improve sign-ups. Because you have just agreed that you would like to try something different you feel almost compelled to sign-up to act consistently with how you replied to the first pop-up. This is a really clever way of using the psychology of commitment to improve sign-up rates. Become a customer for free! Commitment and consistency is one reason why free trials or offers can be very powerful tools of persuasion. Whilst working for an insurance company we offered prospects the opportunity to sign-up for a year’s free accidental death cover in return for providing their email address and name and address. Due to the low level of cover and the fact that the probability of an accident causing death are quite small this cost the company relatively little money. However, we managed to sign up many thousands of new customers from the campaign. We could then target them with other products that they were now more likely to buy as they were no longer prospects, but customers. To achieve a high rating and a positive review of the user experience only target loyal customers. Make sure you then email these users to thank them for their efforts and confirm that their review will be publicly available for all users to see. 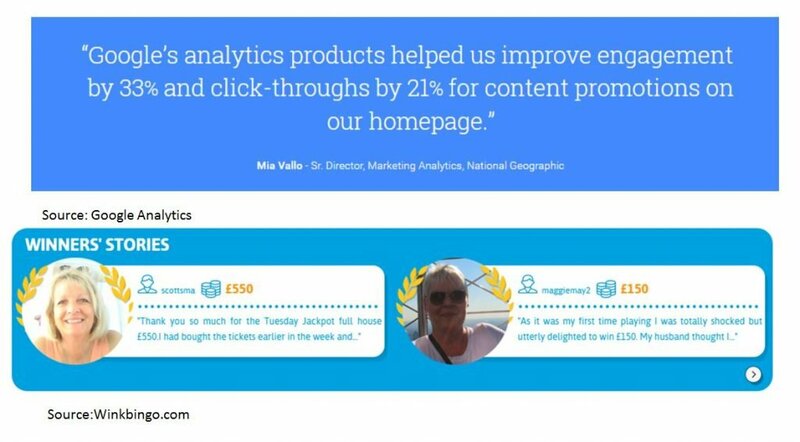 Run competitions for slogans, strap lines and testimonials with a promise to display the best ones on your website. Once people have written a positive statement about your brand they are more likely to become a brand advocate and will be a positive influence on other potential customers. Offer a dream for commitment and consistency! JohnChow.com offers advice on how to monetise your blog site. 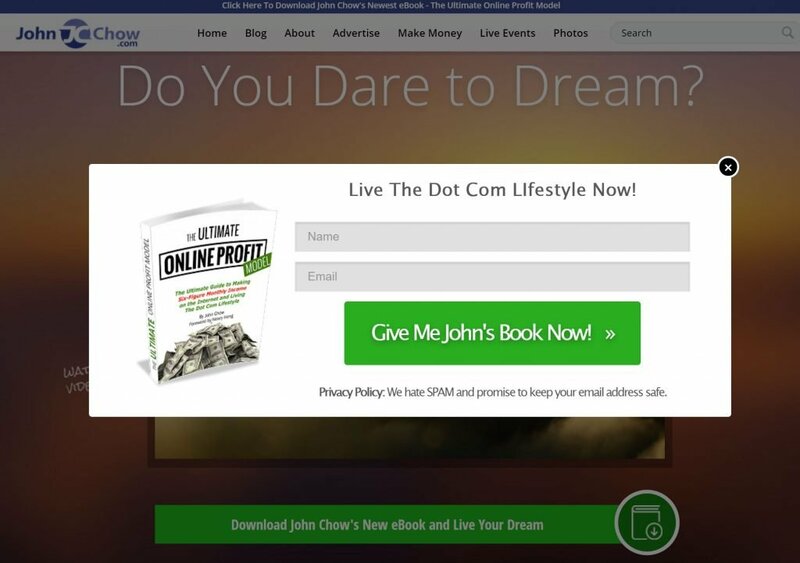 On the homepage there is a great heading in the form of a question – “Do You Dare to Dream?” The very prominent single call to action offers you the chance to download John Chow’s free eBook and “achieve your freedom”. This is a form of commitment as the heading is asking visitors a question and the eBook is a possible solution. Once you click on the CTA you are served a very simple form asking you to enter your name and email address. As visitors have clicked on the CTA which promises “achieve your freedom” they are likely to feel compelled to complete the form to be consistent with their previous commitment. In addition, as they will now perceive themselves as customers this should increase the likelihood that they will be prepared to buy one of JohnChow’s services at some point in the future. Commitment and Consistency for consistency’s sake! Digital marketers can also fall into the trap of commitment and consistency. Brand guidelines create a strong commitment that most people feel obliged to adhere to. However, applying consistency without thought can harm the user experience and reduce conversion. I often come across copy that is low contrast and unreadable or the CTA is not prominent because designers have blindly followed brand guidelines. Brand guidelines should not be used as excuse not to think about the design and how it appears to the user. Because brand guidelines cover the whole site there are often instances where they just don’t make sense because guidelines are just that. They should guide, but not be applied automatically without thought. Otherwise conversion will suffer due to designers being influenced by commitment and consistency. Below is an example from partycasino.com which uses a grey font on a black background. The contrast is really poor and the use of pink for hyperlinks is especially distracting. Displaying identical navigation elements in the header across the whole site can result in redundant and distracting navigation tabs on certain pages (e.g. Join Now link shown on a sign-up form). This can also lead to situations where certain navigation elements (e.g. an Options tab) only have one menu item on some pages because of the site structure. Consistency in design is seen as beneficial because the user becomes accustomed to what to expect from a site. However, this begs the question should we never surprise visitors? The answer to this depends on the context, purpose and quality of the surprise. What is the cost of not surprising visitors compared to the benefits of delivering something unexpected? Consistency is only one of a number of design principles and sometimes they conflict with one another. If we want to optimise conversion this may sometimes mean making compromises with consistency to give priority to more important elements of the user experience. 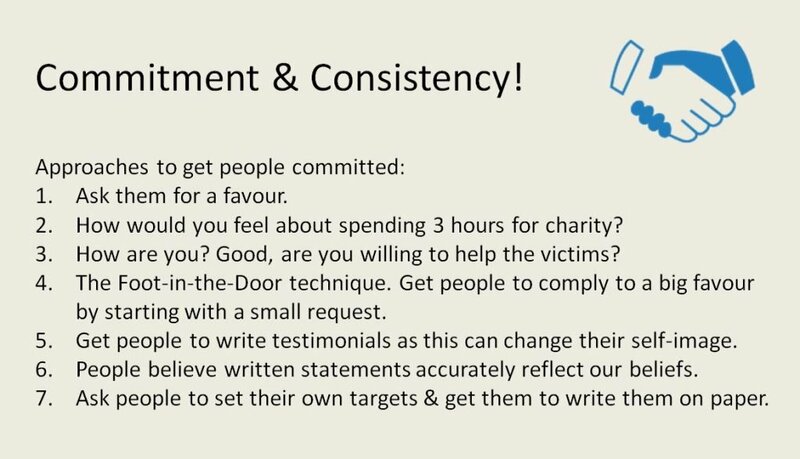 Avoid being overly influenced by commitment and consistency as this can reduce conversions. Commitment and consistency is a powerful force in social influence that can be employed to nudge users towards desired actions. Remember commitment is the main driver of consistency and it is one of the few persuasive weapons that can also change a person’s self-image. Consistency is such a strong motivator that it can even create habits that will sustain long-term behavioural change. Use it with care and also avoid falling into the trap of consistency for consistency’s sake when making design decisions.